It is pretty clear by now: The company of the future is a lot more than only a place to work. While we still think in terms of work week and weekend, pre- and after-work activities, colleagues and family / friends, modern companies have already developed and implemented concepts that totally mix up this way of thinking and living. It all started with the often described ‘war for talent’. Companies tried to make the difference in order to attract – and even more important – retain talent. 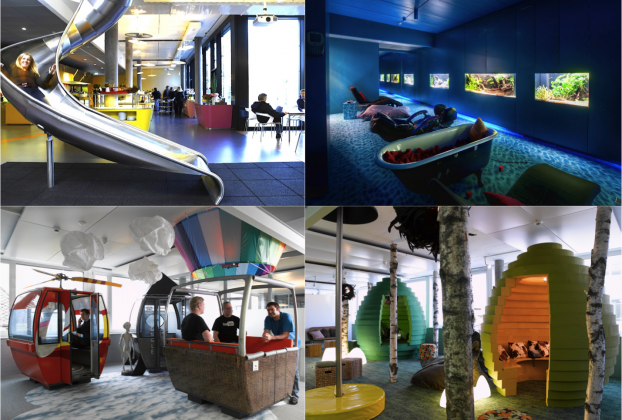 They created colorful office worlds with lots of different functional areas far away from the traditional office style we have seen for decades. Everything has been focused on a less formal more comfortable style in order to let creativity and productivity flow. The way of working in general, but especially the way of working together as a team has been influenced tremendously by the newly created atmosphere. A development which was highly welcomed by the younger work generation specifically. But this was only the beginning. In the meanwhile we see a lot more in favor of the employee. I have recently been at the new EMEA HQ premises of one of the most innovative and fastest growing companies worldwide. The building has just been built and was in full use for a few weeks only. I was lucky enough to get ‘the grand tour’ in order to see all the new facilities. Apart from wide, open and light working spaces with hydraulic tables that can be adjusted to every height (sitting to standing), coffee corners on every floor, a daily grand lunch buffet that is comparable to a 4-star hotel (all for free of course), a wonderful coffee bar on the top floor with a huge roof terrace and a beautiful view over the city, there were other features that I hadn’t expected to see: music studios (for practicing an instrument or band rehearsals after work), a cinema/theater, relaxing/napping zones, a yoga room and of course a fully equipped gym as well as an outside sports court that is open 24/7, even in the weekends. By the way I got the apology for not having an own swimming pool just as the other company down the road… Services as dry-cleaning, child care, food shopping, etc. are available for every employee as well. Young, flexible and dedicated employees pretty much find a home away from home with these companies. All they still need is a bed somewhere, but the rest of their lives can literally take place at the employer’s. Many of these companies recruit people from other countries so everyone is pretty much new to the place and colleagues become friends very quickly. The employer takes over the role of home and family more and more. There is almost nothing you can do at home that you can’t do at the employer’s as well. And of course the employees’ families can be integrated as well, if they want to. Whenever you visit such a company you see a few employees showing around their parents or friends.